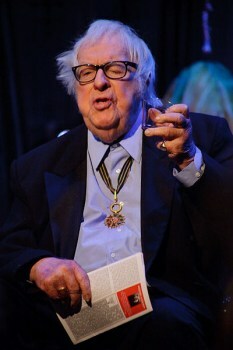 Science fiction Grand Master Ray Bradbury has died. Born in 1920, the great Ray Bradbury was one of the most widely admired, respected and celebrated authors of the 20th century. Although best known for the novel Fahrenheit 451, he was also a prolific author of short stories and saw a significant portion of his work translated to television and film, and actually won an Emmy Award in 1993 for The Halloween Tree. From 1985 to 1992, he hosted his own television series, The Ray Bradbury Theater, which aired 65 episodes based on his work. I didn't know Ray so I can't really comment on what a great guy he was, nor am I a serious aficionado of his work; I read Fahrenheit 451, of course, but I made no particular effort to pursue him beyond that. I'm a bigger fan of his short stories, like The Pedestrian, A Sound of Thunder and I See You Never, which despite its great brevity - it takes up all of two pages in the 1970 printing of The Golden Apples of the Sun - and for reasons I can't really explain, is perhaps my favorite of his stories. But he was truly one of the greats, an incredibly talented and influential figure, and he will be missed.